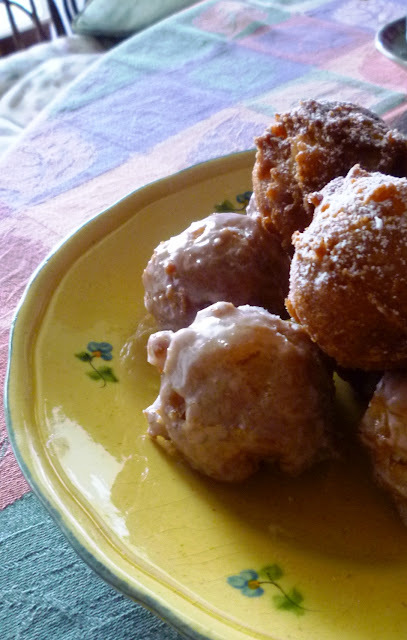 There are several things that might come to mind when you hear the words "apple fritter." I grew up on donut shop apple fritters—plate-sized masses of lumpy, yeast-raised, deep-fried, cinnamon-scented dough... dotted with chunks of apple and coated with a thick, sugary glaze. I loved them then, but they are a bit much for me now. At the other end of the spectrum from this fritter-as-donut concoction is the beignet-style fritter. With these, the emphasis is on the apple. Large wedges or rings of apple are dipped in a light batter...and then deep fried. The batter is important...but it clearly isn't the star.... And as delicious as they can be...they aren't really what I want to eat when I'm in the mood for an apple fritter either. The kind of apple fritter that interests me rests somewhere in between these two styles....some might call it a traditional—maybe even home-style—fritter. These fritters are quick and easy to make—being nothing more than a simple, sweet, muffin-like batter that's full of small cubes of apple and fried by the small spoonful. If you are familiar with corn fritters...or zucchini fritters...you will recognize this style of fritter. These apple fritters—like their savory cousins—are loaded with the namesake ingredient. At the same time, there is still enough of the sweet fried dough to give an admirable impersonation of a doughnut hole. 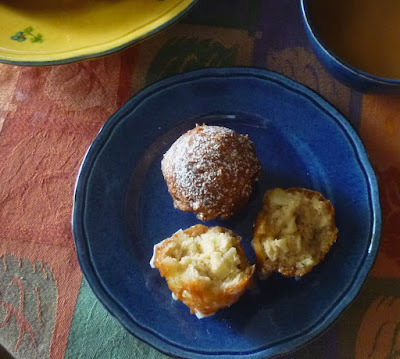 (In fact, if you choose to scoop the batter with a small ice cream scoop, these fritters are nearly indistinguishable from donut holes.) They are, I think, the best of both worlds. My apple fritter recipe is an adaptation of the one developed by America's Test Kitchen. Their recipes are typically very reliable and I was attracted to their use of apple cider in the batter (instead of milk) to give added apple flavor. In my version, I substituted sour cream for some of the cider. 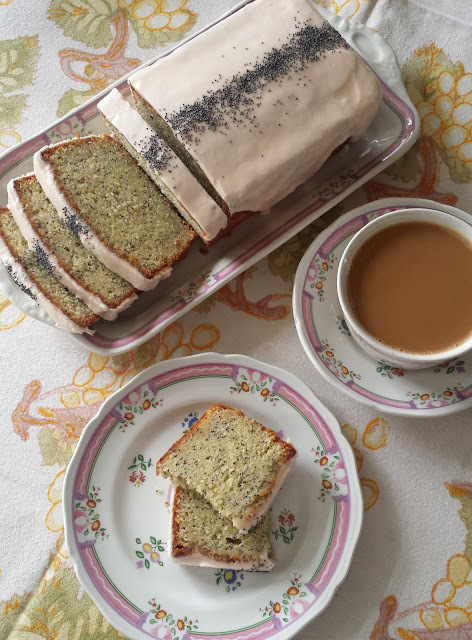 I love the flavor and added tenderness that sour cream adds to cakes and muffins. 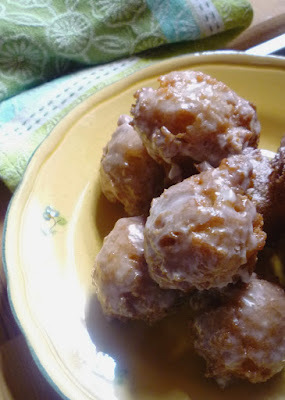 Furthermore, since "Old Fashioned" donuts (always made with sour cream as far as I'm aware) are probably my favorite donut, I wanted to add it to my fritters. The only other major change I made is in the way I add the butter. In the original recipe (and almost every other recipe I have ever seen), the butter is melted and added to the liquid ingredients. 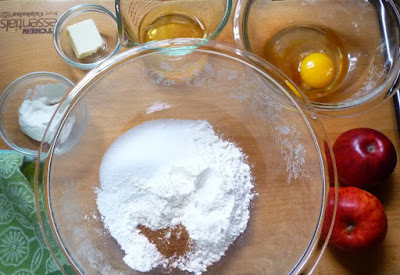 In typical muffin-method fashion the liquid ingredients are then combined with the dry ingredients. I chose to rub softened butter into the dry ingredients (as you would for biscuits or scones) instead. I felt like this would aid in inhibiting gluten development (as it does for pâte brisée)—which would in turn help make for a more tender fritter. In addition, it produces a firmer batter that is easier to scoop into the fryer. I was very happy with the result...but I'm sure the fritters would be delicious if made with melted butter too. I suppose that I should admit I'm not a huge fan of deep fat frying. It tends to be a bit messy...and the house always smells of fried food for a few hours after (no matter how effective your exhaust system). In addition to all this, deep frying uses a huge quantity of oil. It has always seemed kind of wasteful to me. But, there are some things that are worth it....and every so often—for a special occasion—I like to indulge. Since I have never posted anything deep fried before, today's post seems like a good place to discuss some basics. You don't need any specialized equipment other than a candy/deep fry thermometer. Any appropriately sized sturdy, heavy-bottomed pot or pan can be made into a deep fryer. It needs to be at least 4 inches deep since you will need to be able to add oil to a depth of 1 1/2 to 2 inches and still have at least 2 inches between the surface of the oil and the rim of the pot. If the pot is too full, the hot, bubbling oil might overflow...which could cause a fire. While on the subject of oil: any neutral vegetable oil will work...safflower, canola, refined peanut, and sunflower oil are all good choices. Before heating the oil, make sure that you will be able to give the deep-fryer your undivided attention. Small children and pets hanging around under your feet are a bad idea. If your pot has a handle, make sure it is positioned away from you so that you won't accidentally bump it and slosh hot oil out of the pan. Also, make sure you aren't wearing something with loose sleeves...or anything else that could fall into the oil...or snag the pot/pan in any way. Finally, have everything that you will need ready to go: whatever you are frying, a wire rack set over a rimmed tray lined with paper towels and a slotted spoon or mesh skimmer for scooping your fried food out of the fryer. When you are finished, turn off the heat and make sure the pan of cooling oil is positioned someplace where it won't be knocked around (a back burner of the stove is ideal). Let the oil cool completely. If it hasn't darkened too much, it may be reused. Strain the oil into a clean container (or the bottle the oil came in, if you used the whole bottle) and store it in the refrigerator until you decide you want to deep fry again. If it has darkened too much to use again, simply discard (don't pour it down your drain!). I should point out that you can of course make this batter into very large fritters if you like. The original America's Test Kitchen recipe does just that (and makes 10 fritters instead of 25 to 30). I make mine small for a couple of reasons: First, I just don't want to eat something that large! It's just too much.... Really. Secondly, in order to cook such large fritters, you need a lower fryer temperature. At the higher temperature (used for the small fritters) the large fritters would brown before they were cooked through. And, as I already mentioned, they tend to absorb a lot of oil at this lower temperature. I think this makes them almost indigestible. 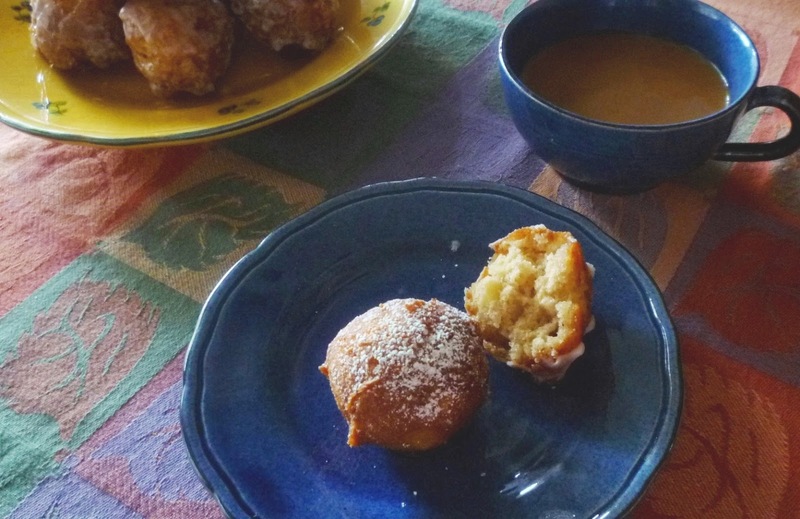 After frying, your apple fritters can be finished in a number of ways. A simple sprinkle of powdered sugar is delicious. They are also good rolled in cinnamon-sugar. I think that my favorite though is a cider and powdered sugar glaze. If the fritters are dipped while they are still slightly warm, some of the thick white glaze will be absorbed as the fritters cool. Then, when the fritters have cooled and the glaze is set, it has a crystalline, slightly translucent look. However you choose to finish them, you should make them and enjoy them on the same day. I'm not sure I have ever had them last longer than a few hours, but like any fried food, I'm sure they are best when very fresh. You can do much of the work ahead...mixing all of the liquids in one bowl...and mixing the dry ingredients—including the soft butter—in another. Then about an hour before you want to serve them, dice the apple, blot dry and add to the dry ingredients. Combine everything...and let it rest while the oil heats. Fried food doesn’t get much simpler. If you have never deep fried anything before, these are a fun place to start. Everyone loves them. They would make a great addition to a breakfast or brunch...or an autumn or holiday buffet...or as a special occasion treat. Spread the apples in a single layer on a baking sheet lined with a double thickness of paper towels. Pat the apples dry with more paper towels. Whisk together the flour, sugar, baking powder, salt and spices. Add the butter and using your fingers, rub the butter into the dry ingredients until the mixture resembles coarse sand. In another bowl, whisk the eggs with the vanilla and sour cream until smooth. Whisk in the cider. Add the apples to the dry ingredients and toss to coat. Pour the liquid ingredients over the dry ingredients and using a rubber spatula, mix just until the batter is homogenous, smooth and thick. Don't over mix. Cover with plastic wrap and let rest for 15 to 20 minutes. While the batter rests, pour the oil into a medium, heavy bottomed pot to a depth of 1 1/2- to 2-inches. Heat the oil over moderate to moderately high heat until it reaches 350°. Working in batches of 5 or 6, use a small ice cream scoop (1 1/2 to 2 tablespoon size), or a mounded table spoon, to carefully drop small dollops of batter into the hot fat. Regulate the heat as necessary to maintain the temperature of the oil. Cook the fritters, rolling them over two or three times as they cook (they may roll over on their own), until golden on all sides and cooked through—about 3 to 5 minutes per batch. Using a slotted spoon or mesh skimmer, transfer the fritters to a rack set over a paper towel lined sheet pan. Repeat with the remaining batter. 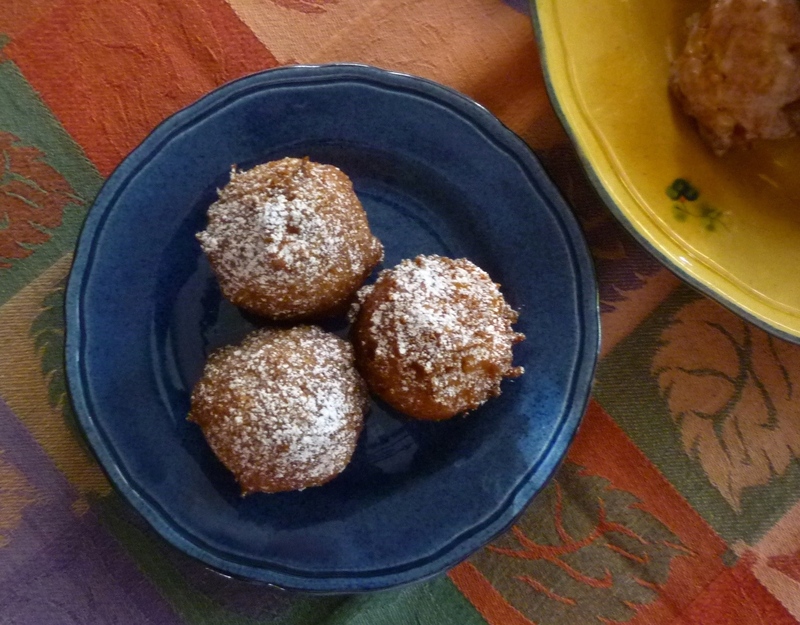 The fritters may be served warm or at room temperature. They are best served the day they are made. Makes 25 to 30 fritters. Note: Fritters may be made with almost any apple—choose tart or sweet...as you prefer. I like these with Jonathan, but Granny Smith, Golden Delicious, Gala or Braeburn would all be good choices too.